Poised on a half acre midway between ocean and village within a new enclave of summer cottages on Amagansett's coveted Lanes, a newly constructed traditional home is nearing completion from Farrell Building Company. 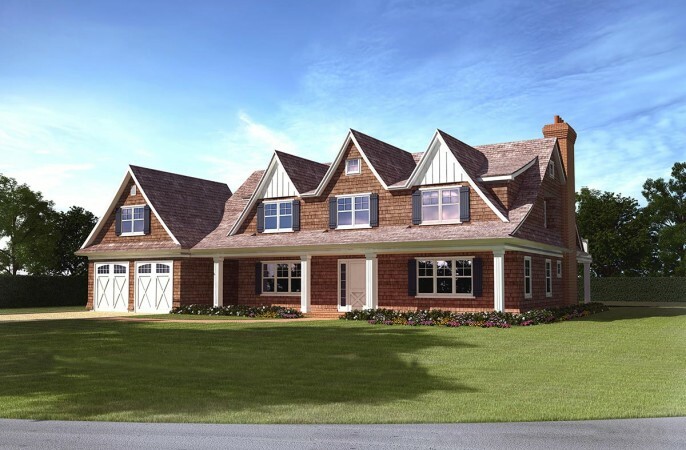 With all the amenities and finishing's you've come to expect from the Hamptons most prolific builder, this 4,100SF residence offers a grand 2 story foyer leading to the great room with fireplace, living room, formal dining room and a gourmet kitchen augmented by a walk in pantry. Powder room, mudroom with custom cubbies, laundry and a 2 car radiant heated garage complete the first floor. Upstairs the master suite with fireplace and private terrace reigns over 4 additional bedrooms with baths all ensuite, all serviced by another laundry room. An additional 1,800 SF of living space can be found in the finished lower level which includes staff suite. recreational rooms and abundant storage. Outside a pair of covered porches overlook the heated Gunite pool with spa framed by stone patios and verdant lawn and landscaping. Preview today in order to be able to enjoy this beautifully built new home for Summer 2014 and for many years to come.